Humility – or the ability to learn from others, to be part of the group, and to understand and accept personal limitations - is at the heart of a 1,500 year old rule developed and used by Benedict of Nursia to guide the religious lives of monks. We will explore Sr. Joan Chittister’s wise and witty insights on twelve simple ways that can shift our attention to how God wants us to live today and free us from anxiety, worry and tensions. Called “wise, sharp, funny and timely,” this book is a delightful read for anyone seeking greater peace and interior freedom. 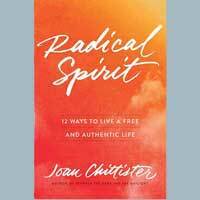 This study will involve personal reflection, sharing, and spiritual practices and is a fine way to prepare for June 1,2018 when Joan will be coming to Kalamazoo to speak. Please bring the book and come to the first meeting ready to share something that intrigued you in the first four chapters. The program fee for the series is $36, and includes handouts and facilitation. Please register by January 18. Payment in full is due prior to arrival.